The Gadhimai festival of 2014 was the last ever! 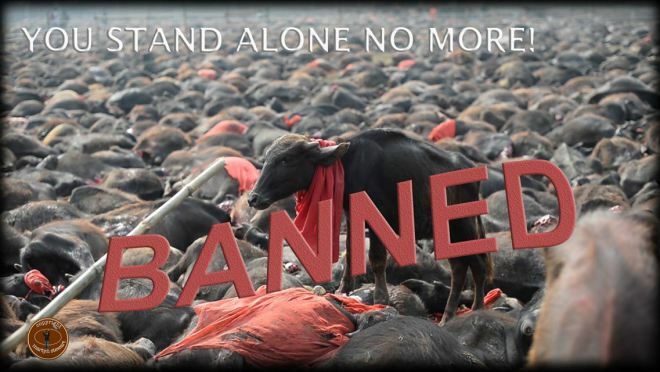 “For centuries the Gadhimai festival in Nepal has seen temple grounds awash with the blood of animals slaughtered in the name of ‘tradition’. This sacrifice has occurred every five years for the last 300 years. Are You Covered to Travel Nepal? Many tourists, including adventure tourists, are wondering if their travel policy will cover their trip to Nepal. World Nomads, a leader in adventure travel insurance, has clarified that traveling to Nepal is safe and their current policy do cover a trip to nepal. On 9th June 2015, Nepal Tourism Board declared the country was safe and open for tourism. Of the 75 districts of Nepal, only 14 suffered significant damage. Most of trekking trails and peaks are safe and open for the upcoming Autumn season. Therefore, if you are looking to travel Nepal in the Autumn 2015, you can do so. Many travel insurance providers like World Nomads will support your trip. A major decline in tourism would be another disaster for Nepal. We need to be very clear it’s business as usual in Nepal from September. Police in India have arrested two airline employees in connection with what is suspected to be a human trafficking operation centered on smuggling female victims of the Nepal earthquake to Gulf countries, the Agence France-Presse news agency reports. The two ground staff members working for the national carrier Air India were arrested earlier this month after police at New Delhi’s international airport found seven Nepalese women heading to Dubai who had their travel documents stamped despite not having cleared immigration controls. Under questioning, the airline employees said they had been paid to furnish forged documents for the seven women. In a subsequent raid on a local hotel, police found an additional 21 women who will now be returned to Nepal along with the seven stopped at the airport on 21 July. Recent Gurudaspur incident might have strengthened Yakub Memon’s prosecution to hang till death. Might the late night reviews of the judgement have occurred due to this. The question is what was the purpose of Gurudaspur incident[ there are few more susceptible incidents related to the terror attack]? To strengthen the decision of Memon’s prosecution? India Govt felt pressurized by the recent terror incident? The whole thing seems a little crafty………………it all held so that Memon could be wiped…………….so that the information he was holding could not be extracted by India and at the same time a message to the terrorist bhai-log , “beta, India ke pass surrender karoge to Memon banoge” . I believe a thorough CBI inquiry is needed for the entire 27th July incident. APJ: A big inspiration to the younger generation…………..
My humble respect and gratitude to Dr APJ Abdul Kalam. May his soul rest in peace. No decision is bad until and unless we fail to execute it. Want to see a fire missile in Johnson’s bowling. Rest is upto you guys………to be or not to be 🙂 . Three months after a series of devastating earthquakes shook Nepal to its core, the country is still scrambling to rebuild. According to Red Cross, one in four Nepalese have been affected, many of whom are suffering from the trauma that arises from experiencing a natural disaster this size. Along with other organisations, two IRCT members are on the ground, working tirelessly to support victims of the earthquake with psychological first aid. April’s earthquakes took the lives of more than 8,000 Nepalese and left hundreds of thousands injured and homeless. “Many people lost their life when their houses collapsed,” Jamuna Poudyal from Kathmandu based organisation Centre for Victims of Torture (CVICT) told us back in April, trying to comprehend the sheer scale of the disaster. “People in the Kathmandu Valley still feel that their life is in danger because of the many aftershocks,” she explained. Becky Bottle (right in image above) is a returned International Citizen Service (ICS) volunteer who spent three months in a rural community called Makaibari in the Dolakha region of Nepal. Following her campaigning efforts after the earthquake struck, she was invited to a UK Government roundtable discussion in Edinburgh about the Scottish response to the crisis. Her reflection on the day and Restless Development’s contribution to the response is below. I returned from an incredible three months in Nepal in April this year. It was strange enough adjusting to being back the UK when, just two weeks after my return, the devastating 7.8 magnitude earthquake struck the country on 25th April. On the 25th of April, 2015, catastrophe struck Nepal in the form of a 7.8 magnitude earthquake which claimed over 7,000 lives. Roads became dysfunctional, mobile networks jammed, marketplaces got shut, and in the vacuum created by shock and grief, the media rushed in. When I landed in Kathmandu, on the 1st of May, shops were re-opening and taxi-prices reducing. The extra food I’d carried quickly seemed superfluous, given my hotel near the Pasupati temple had no shortage of food, electricity or water—comforts I wasn’t prepared for mentally by television reports. Over the course of my stay, I visited Kathmandu, its outskirts and some distant mountain villages of districts Sindhupalchowk and Gorkha. The scale of sorrow was piercing—many had lost family members, yet more had lost homes. All had lost the ability to get a single night of peaceful sleep undisturbed by aftershocks, real or imagined.